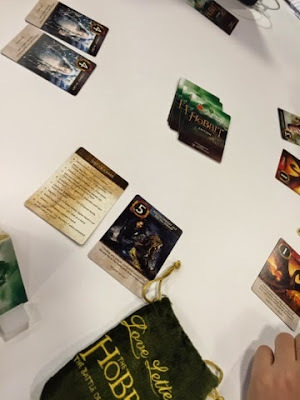 So while visiting the AEG booth at the Toy Fair, I was introduced to 2 upcoming Love Letter editions, Batman and Hobbit. Now when I first heard of these many many editions of Love Letter, my first reaction was "Oh no, they are just revamping the art and milking it for all its worth.....". To my surprise though, there are some changes in the rules and Todd from AEG mentioned they do check back with Seiji san (original designer of Love Letter) to seek his advice and approval which, to me, is quite cool. So just how different does The Hobbit love letter play? Lets take a look. At its core, The Hobbit love letter plays the same. If you can kick out the rest of your opponents, you win. If the round ends, you check who has the highest number and that will be the winner. Depending on the number of players, first to win a certain number of the plastic gems, will be the overall winner. At first, I did not really notice a lot of differences except for the art. I think they took them from the movie and it looks great! After a few rounds then you will start to notice the differences. For example, there are 2 different Number Three cards. 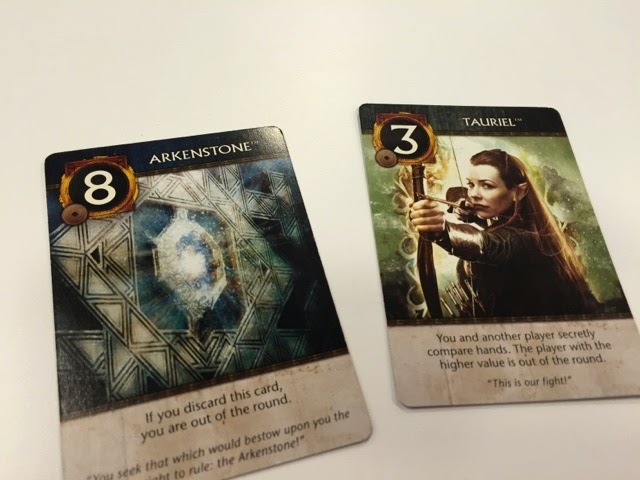 Tauriel which will cause the higher hand to be out and Legolas which plays normally. Interestingly, there were quite a few instances where a player has both the Arkenstone (8) and Tauriel (3) which means that player is out of the game instantly. While it is interesting, this change seems to make a somewhat random game feel even more random. One of my friends even wanted to rage quit after he gotten that combination twice. The other main change was the The One Ring card which changes to a 7 if you manage to keep it all the way to the end. This is interesting though and I was wondering why it doesn't change to a 9 so as to beat the Arkenstone if you manage to hold on to it to the very end. 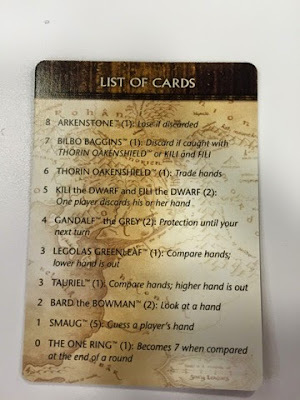 It was not as useful though as you might expect because most of us discarded it often as soon as we got it because many of the other cards can easily beat The One Ring card. Many thanks to AEG for this review copy!